Improving energy efficiency of buildings is widely considered as the one of the most promising, fast and cost-effective ways to mitigate climate change and achieve the 2020 and 2050 goals set for the built environment (European Commission 2011; Aedes 2017). Energy efficiency of the building stock is hard to achieve if we only focus on the design of new dwellings. In this chapter, we will analyse the energy efficiency state of the existing Dutch non-profit housing stock using data from 2015. We examine the energy efficiency state of the stock using data from the SHAERE monitoring system. The data from SHAERE include the age, type, useful floor area, thermal resistance (Rc-value) of the envelope (roof, facades and floor), thermal transmittance (U-value) of the windows, heating and domestic hot water (DHW) systems, ventilation system, the predicted heating energy consumption and energy production systems, if present. We also use actual heating energy consumption data from Statistics Netherlands to calculate the mean actual energy consumption of the stock. The chapter aims at setting the current energy performance state of the Dutch non-profit housing stock. 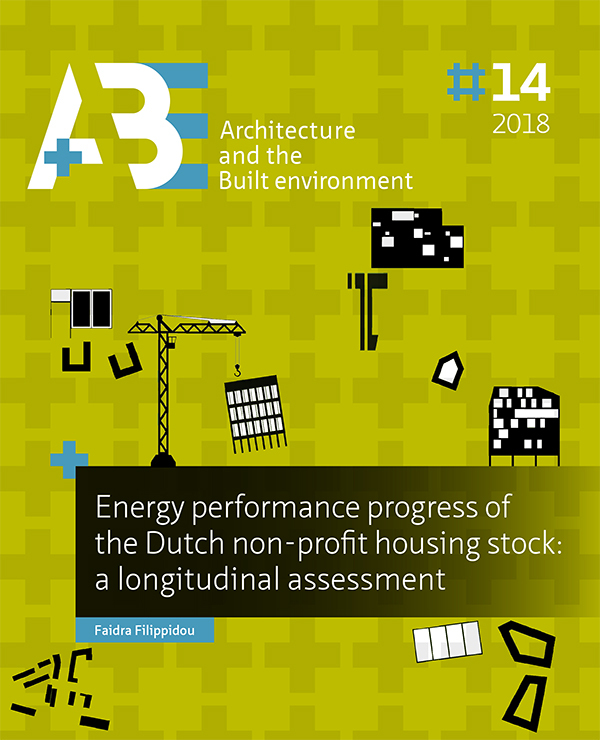 A complete and detailed assessment of the current efficiency state of the non-profit housing stock in the Netherlands is necessary in order to examine the energy renovation pace and energy saving measures realised. The following sections present the results and conclusions drawn from this chapter. Section 2.2 presents the development of energy efficiency policies in the built environment. The SHAERE monitoring system is presented in 2.3. Section 2.4 sums up the methods used. Section 2.5 brings attention to the results of the research study. Section 2.6 presents the conclusions of this chapter. FILIPPIDOU, Faidra. Energy efficiency state of non-profit housing stock in the Netherlands. A+BE | Architecture and the Built Environment, [S.l. ], n. 14, p. 61-82, dec. 2018. ISSN 2214-7233. Available at: <https://journals.open.tudelft.nl/index.php/abe/article/view/3549>. Date accessed: 26 apr. 2019. doi: https://doi.org/10.7480/abe.2018.14.3549.